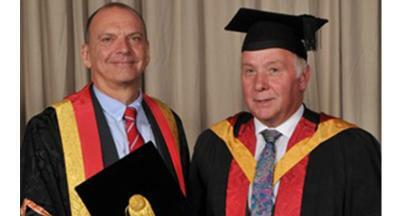 A successful Aldridge businessman has received an honorary fellowship from the University of Wolverhampton. Ian Aspley was presented with the honorary by the Wolverhampton Business Solutions Centre on Thursday, 4 September. He was recognised for his impressive record in business and his support to the Business School through mentoring, guest lectures and workshops. Ian has over 10 years’ experience at senior board level as manufacturing director for an international building materials manufacturer involved in long term business strategy. He has over 35 years’ experience in manufacturing, distribution, health and safety, project management and negotiations with unions and suppliers at all levels. An enthusiastic communicator and strategic thinker with both financial and analytical skills, Ian is currently a non-executive director at Proskills UK, which supports training and education for those working in the material, production and supply industries. Ian is also a trustee of a small charity based in The Gambia. The charity’s aims are to provide education, community development, primary healthcare, skills training and employment opportunities in one village. The award was presented at Wolverhampton Grand Theatre as part of the University's graduation ceremonies.